The Churchill Fellows will investigate new ideas and techniques in various heritage crafts specialisms, helping to ensure a healthy and sustainable framework for the future of the industry. This is the third year of a partnership between the Winston Churchill Memorial Trust and the Heritage Crafts Association. During this time 27 Fellowships have been awarded, an investment of over £170,000 in the UK craft sector. Past projects include research into sustainable furniture design, bronze casting and stonework techniques. Alana Madden, a Cabinet Maker from Dulwich, who will be travelling to Japan and the USA to study approaches to increasing the representation of women in the construction industry. Romily Alice, an artist and neon bender from Leeds, who will be travelling to Germany and the USA to study neon making with master craftsmen. William Grant, a sheet metal worker from Spilsby, Lincolnshire, who will be travelling to Austria, the Netherlands, Sweden and the USA to investigate prototyping techniques for creative sheet metal work. David Tucker, a designer and master blacksmith from Derby, who will be travelling to Norway and Sweden to explore the influence of Scandinavian craftsmanship on contemporary British blacksmithing. Rajni Patel, from Ashburton, Devon, and Relationship Manager at Arts Council England, who will be travelling to India and Japan to research traditional and contemporary craft practice. Faye McNulty, a textile designer from Hackney, who will be travelling to Australia and Japan to study traditional and sustainable textile print processes. Jack Darach, a recorder maker from Brighton, who will be travelling to Germany, Japan, the Netherlands and Switzerland to discover strategies for rejuvenating the craft of recorder making. 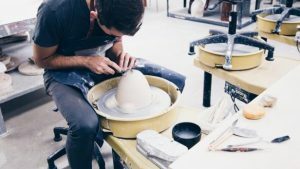 “Churchill Fellows in our Crafts and Makers category have used the experience of travelling overseas and meeting with others who share their specialism as inspiration to deepen their contribution to their field. Our hope is that our 2017 Fellows will also enjoy the experience of a Fellowship, and return to the UK equipped to strengthen the crafts industry so that sole practitioners and the traditional crafts can continue to thrive”.